Today, during an impromptu thrift shop stop, I found this beautiful sweater. 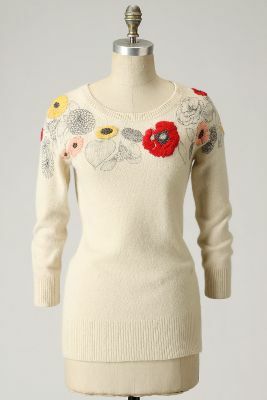 It is the Anthropologie brand Sleeping On Snow and it is called the "Sketchbook Pullover." I almost keeled over. It is new with tags and I bought it for $5.99. Little Mouse was with me, and she didn't really get what the fuss was all about. $5.99? Madness! Actually, the shop was packed with lots of beautiful stuff today. Given that I live in a college town, I'm guessing a whole mess of students emptied out their drawers and closets before they left town. I also found a crazy nice bathing suit top and a bunch of other summer shirts. It isn't often that I score big for myself on my thrift runs (usually lots for the kids), and it felt really nice. Last night, I bumped into this bag on etsy. I have a little birthday money tucked away (from February!) and I think I might spend it on this. 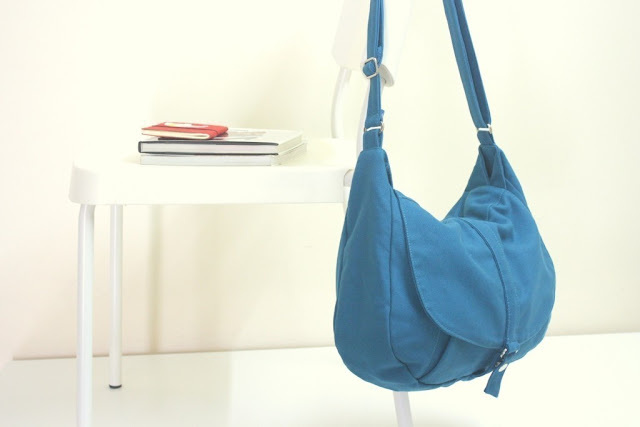 The shop used to sell the same bag in a kelly green color, which I think I would have loved. I think I'll like this watery blue just as much, though. And, this is a vintage potato masher, which I just listed in the t r e a s u r e s section of my shop. I have the same one in my kitchen and I use it every time I make mashed potatoes or banana bread (it mashes partially frozen bananas perfectly). I saw it and figured that someone might want one too. You may have noticed that I haven't been posting many craft projects lately. I actually have been spending lots and lots of time crafting and creating in the studio, but most of the projects are for magazine and book deadlines, so I can't share just yet. In the meantime, I'm having lots of fun finding treasures and posting about our outdoor adventures. Alrighty. Despite the warm and humid air, I'm going to go cuddle with my new sweater.